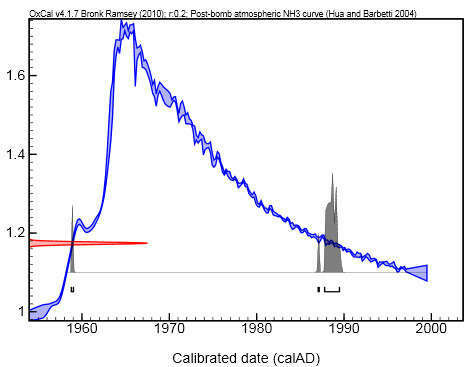 Post-bomb calibration curve (blue) and interval of calibrated dates (grey peak). Radiocarbon date: post 1954. 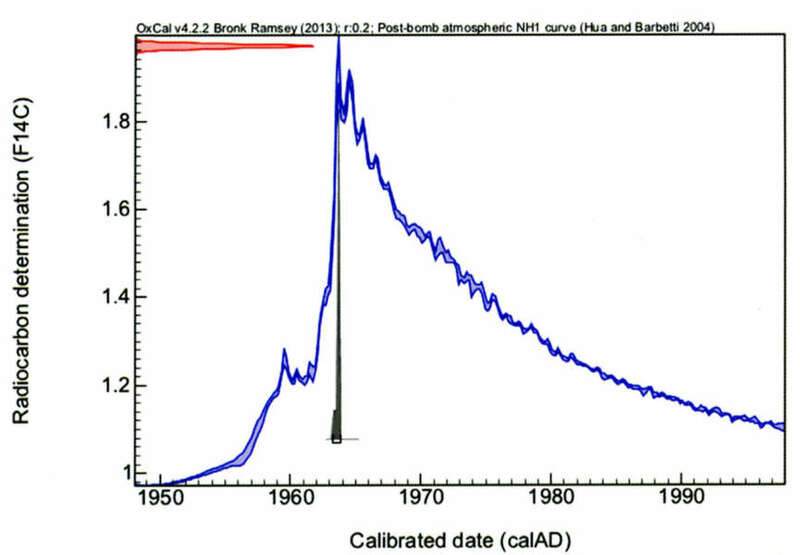 Calibrated dates: 1963-1964 (95,4 % probability). Carbon-14 (C-14) dating, also called radiocarbon dating, makes it possible to determine how much time has elapsed since an organism’s death – for example, the felling of a tree. The method is based on the measurement of the amount of carbon-14 remaining in the tested material. Carbon-14 being a radioactive isotope that disappears over time. When a tree dies, the quantity of carbon-14 diminishes at a known rate – its concentration is divided in half every 5730 years. The measurement of the amount of C-14 present in a sample compared to its original content is what makes it possible to date wood. Obviously, the test dates the age of the used wood and not an object’s date of manufacture. Due to technical reasons, using a C-14 test for an object dating between the eighteenth and middle twentieth century (being the most relevant period for African art), remains problematic (partly to blame on the Industrial Revolution). Different calibrations yield different possible intervals of manufacture with non conclusive probability percentages. For example, the results for a tested mask were: 1661-1664 (20,4 %), 1735-1806 (54%) and 1930-1954 (21 %). The second half of the 18th century here is the most probable period of the object’s manufacture, though for an African mask this is a very early date – the last interval thus might be the correct one. This proves a C-14 test should always be complemented by art historical research. Where C-14 testing could become important is by the definitive determination of whether the tested material existed before or after 1954. This artificial cutoff is man-made. The atomic bombs over Nagasaki and Hiroshima, and especially the extensive nuclear testing that continued in the 1950s, resulted in a near doubling of the amount of C-14 in the atmosphere. Recent objects, created after 1954, thus contain elevated concentrations of carbon-14, at levels higher than ever before in history. These abnormally high levels of C-14 thus can serve as a so-called “modernity marker” (quoting CIRAM). A copy of the late 20th century can easily be distinguished. Additionally, since the halt of nuclear testing in the atmosphere, which took place in the early 1960s, the diminution of the amount of C-14 has been very regular. This has made it possible to date recent materials very precisely, with an error margin of only one to two years. Over time, this test thus will become an important tool for the African art market. Unfortunately at the moment it is still a bit too expensive (€ 1190 at CIRAM) to be used extensively. Mostly high-level works of art are currently being dated, though they often don’t really need the additional confirmation. Art historically, testing the € 5000 masks or figures could be far more interesting, while in such instances the cost is disproportionally large. Post-bomb calibration curve (blue) and intervals of calibrated dates (grey peaks). This entry was posted in Research on September 21, 2013 by admin.